Today, Automotive News broke a story saying the new Ford Bronco and Ford Ranger will each be the lucky recipient of a solid front axle, an ingredient that I think is necessary for the Bronco to truly compete with the mighty Wrangler. I’m just not buying it yet. I woke up this morning to the headline “Check your 6, Wrangler; Ford Bronco will have solid axles, too,” at which point I began writing in all caps and shouting with joy that the gods were granting this world with such beefy, articulating off-road goodness. Then I looked into it, and my joy came to a screeching halt. I’m not sure I agree. Especially considering the term “axle” tends to refer to the driveline between two wheels on the same cross-car axis, whether it’s a solid beam axle or an independent setup with exposed CV axle shafts. Opening Dana’s AdvantTEK spec sheet, you’ll find mention of two different “front independent suspension” designs. Having established that “axle” doesn’t necessarily refer to a beam-type axle, and that Dana’s AdvantTEK gearing applies to both independent front suspension and solid front axles, I called up Ford to see if the company would give me a hint. And they did. 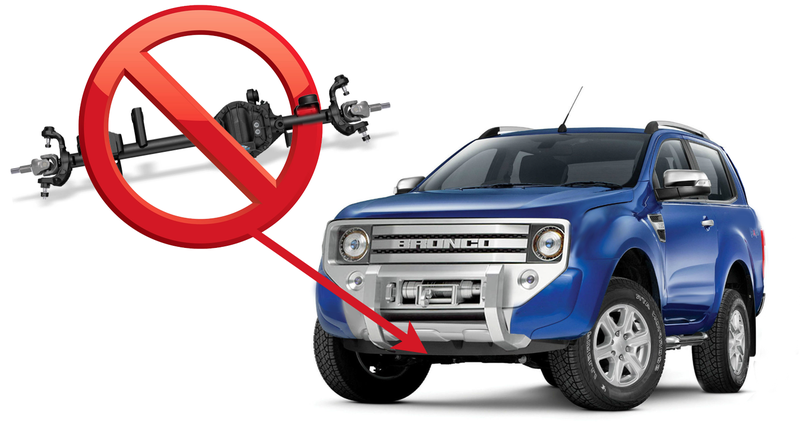 After inquiring about the front suspension design on the new Bronco and Ranger, I was told by Ford’s spokesperson—who could only speak about the Ranger—simply that the truck would be based on the T6 Ranger you currently can’t get in the U.S. (The Bronco is also expected to be based on the T6). And you know what kind of front suspension the T6 has? Independent. Add to these the fact that Ford doesn’t make a single non-heavy duty vehicle with a solid front axle, and the fact that the U.S.-spec Ranger has never come with a beam-style solid axle up front, and I’m just not buying that the Blue Oval will be chucking a big steel beam between the two front wheels of its Ranger and Bronco, compromising ride quality and handling. Who knows, maybe Ford will surprise me, and actually spend lots of time and money modifying their T6 Ranger chassis to accept a front axle that is inferior to independent suspension in every environment except off-road, but that seems highly improbable. Personally, I hope I’m wrong with these skeptical thoughts. I’d absolutely love for Automotive News to call me up one day and tell me to eat my sock, because Ford had confirmed a solid beam-style front axle. I want the durability, articulation, simplicity, and the aftermarket support. I want the Easter Jeep Safari to be more than just jacked-up JK Wranglers. All that, to me, is worth enduring the taste of cotton drenched in my own foot-sweat. I’ve reached out to Dana, and will update this post as I learn more.